Patty! Congratulations Patty on winning the free Targus laptop bag from On Time Supplies! 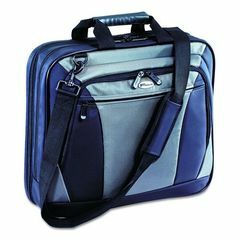 The Targus bag is attractive and durable, so soon you’ll be toting your notebook and office supplies around town in style! I’ll be emailing you soon with the info you need to claim your prize. Just like last time, I used the Random Number Generator from the folks at PsychicScience.org. Patty’s winning entry was posted here at Office Ink, but she improved her chances by registering to win the laptop bag here and on Twitter. You always have three ways to win free office supplies from On Time Supplies: subscribe and comment at Smart Office, and follow and comment @OnTimeSupplies on Facebook and Twitter. What will On Time Supplies give away next? You’ll just have to keep tuning in to Smart Office to find out! Have a great weekend everybody and thanks for playing! Congratulations again to Patty on winning a free Targus Laptop Bag from On Time Supplies!